According to the NIH, 99 percent of all bacteria form communities that adhere to surfaces in matrices of biofilms and biofilms account for 80 percent of microbial infections in the body. Infectious biofilms can become antibiotic resistant and have become increasingly significant to the failure medical implants. In industry, biofilms are harbored in every corner of the world. 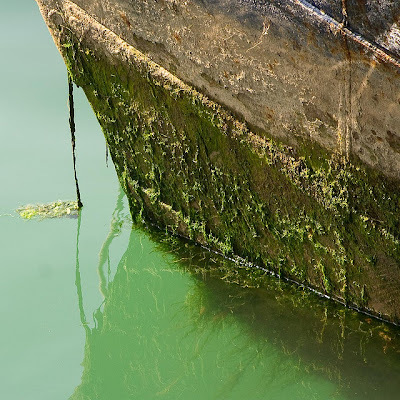 For decades, scientists have studied biofouling on ships and current commercial anti-biofouling treatments often rely on toxic biocides and patterns of surface topology that only prevent some organisms from attaching. To develop the new anti-biofilm material, the scientists took their cues from nature. Clams, snails, oysters and corals fight biofilms with tiny hairs, called cilia, that sweep away foreign particles. While other researchers have tried to engineer surfaces that mimic the fine cilia, the delicate structures and large scale fabrication proved challenging. Rather than structure, the scientists at Duke looked instead at the function of the cilia: movement. The team developed a new material of a stretchy waterproof silicon that shakes off biofilms by forming microscopic wrinkles at the push of a button. The team developed two ways to wrinkle the surface. One way was through inducing an electric field in the material. The team created an "electro-active" coating that wiggles as an electric field turns on and off. The material is made by sandwiching stretchy silicon, metal foil, and an insulating material to form a laminate that can be fabricated to cover large areas. The researchers grounded the surface by dropping an electrode into seawater. When the team applied a DC voltage to the metal foil, a small electric field developed in the stretchy silicon. When the electric field exceeded a critical value, the surface of the stretchy silicon bent into hills and valleys. When they turned off the voltage, the surface became smooth. The second method relied on pneumatic networks embedded within the stretchy silicon. When the researchers pumped pressurized air through the network of channels, the stretchy surface buckled into little craters. To test the two dynamic surfaces, the scientists placed both materials in seawater containing a type of bacteria known to colonize and form biofilms on many materials. After about a week, the researchers returned to test their biofouled surfaces. The team toggled the voltage on the electro-active material on and off 200 times in 10 minutes to wrinkle and un-wrinkle the surface. They found that 95 percent of the biofilm on the elastic surface detached. When the researchers tested the second film controlled with air pressure, they found that when the surface stretched by 23 percent under 3 kPa of air pressure, 100 percent of the biofilms detached. The researchers believe that the material would have similar efficacy with hydraulic networks.